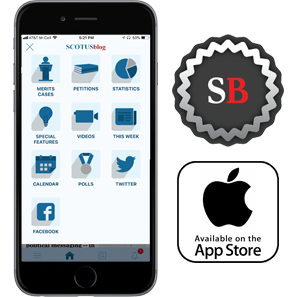 We live-blogged as the Supreme Court released its opinions in Dawson v. Steager and Timbs v. Indiana. Good morning, everyone! Welcome to our snow-day edition of the live blog. We are expecting one or more opinions in argued cases today. As is almost always (except on the last day) the case, we don't know how many OR which ones. One slightly different twist today is that, because of the snow, I am not blogging live from the court today. (Yes, we are weather wimps here in this part of the country.) But we're glad you're here, and we'll do the best we can to get you the opinions as quickly and informatively as we can. How much snow does it take to shut down DC? It's still a little too early to try to game who is writing which opinions in October, because there are four outstanding: Gundy v. US, Madison v. Alabama, Nielsen v. Preap, and Air and Liquid Systems v. DeVries. Has SCOTUS ever closed for weather and who makes that decision? Any prediction as to the likelihood we will see an opinion in Frank v Gaos today? @AmyHowe Who has yet to write a majority opinion for cases from the October Sitting? Ariane de Vogue of CNN reports that there is one box at the Court today -- so not looking like a ton of opinions. We'll know more soon. Before opinions come down, Amy's interview on First Mondays gave great insight into something we don't think enough about, the logistics and luck of reporting on the Court! A worthwhile listen for all! The first opinion is out. It is Dawson v. Steager. It is by Justice Gorsuch and it is unanimous. The decision of the West Virginia Supreme Court is reversed and remanded. Timbs v. Indiana is also out, as a commenter helpfully notes. The Court holds that the Eighth Amendment's Excessive Fines Clause DOES apply to the states. The opinion is by Justice Ginsburg. The decision is unanimous, although Thomas concurs in the judgment. This was the case of an Indiana man whose Land Rover (which he bought with the proceeds of his father's life insurance policy) was forfeited after a conviction for selling drugs. Chris Geidner of BuzzFeed has just noted on Twitter that Justice Ginsburg has just finished reading from her opinion. Not clear whether there's more yet. 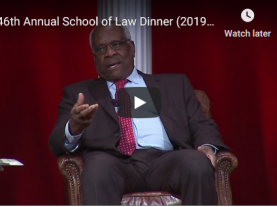 Justice Thomas' concurrence argues that the prohibition against excessive fines should be applied to the states under the privileges and immunites clause of the 14th Amendment, not due process. That appears to be all we have for today. But the Supreme Court is back in session next week, and we have reached the point in the term where we are likely to have opinions most (if not all) weeks. I'm off to get to work on Timbs v. Indiana. Thanks for joining us, and have a wonderful day! Thank you, everyone! Today we will have analyses of these two decisions (Dawson and Timbs), as well as coverage of our lone argument in Mission Products (by Ronald Mann), and previews of two arguments next week (U.S. v. Haymond, by Amy Howe, and Mont v. US, by Fiona Doherty). Thank you everyone for reading!